My colleague Johnathan Browne has posted on his blog (and in Japanese) that we’re organizing a blogger dinner in Tokyo when I came out in a few weeks, if you’re in the area, please spread the word. I’ll be in Tokyo speaking at some events (including Zdnet) and advising clients, and getting some time to spend in this amazing city. Cost: 4,000JPY for Asian Tapas dishes and nomihodai. If you are interested in attending, please contact Ritsuko Tague at rtague@forrester.com / 03.5532.7684 with your name, company’s name, email address and your blog’s URL by October 3rd. Here’s some pics from my last time in Japan, and riding the bullet train (video), I’m really excited to come back. I’m on a quest to meet and greet bloggers all over the world! When you finally meet someone face to face, the relationship bonds stronger than any trackback, comment, or picture can do. Nothing beats face to face meetups, where you hear their voice, listen to inflections, and get a feel from body language of someone’s real persona. Last night was no exception, it was great to meet the several Tampa bloggers last night, nearly half of them were professional (mainly full time) bloggers that benefiting from working in a fantastic city, not slaving away in Silicon Valley! I’m starting to meet more and more professional bloggers, that either work for blog networks, or have found their own niche and have been making money from adsense, banner ad sales, or sponsored marketing. As I visit more and more cities for business, time permitting, I kick off blogger dinners, more often than not, the bloggers in any local city rarely meet up, (despite them interacting online) and often comment; “why does it take someone from out of town, to kick start us to meet”. I’m not sure of the answer, but it’s a great feeling knowing that folks connect, communicate and bond way after the dinner –tis a community thang. It was interesting to talk to the real estate bloggers, some were realtors and others were helping realtors with marketing, they found their efforts to be profitable, giving a leg up from other realtors in a very competitive market. Tony Katz (@tonykatz) who is moving out to L.A.
Real estate blogger Cyndee Haydon (@cyndeehaydon), notice how she integrates video for customer testimonials, smart. If I missed anyone, please let me know. I mistakingly had John Novak @LVRealEstat on the list, he wasn’t there, but we wish he was. Lastly, I was fortunate not to spot any “Dweeting” at the dinner (Drunk Tweeting), a truly responsible group. Update: Video captures calamari with Dave, and it was deemed successful. On my last night of official ‘work’ before going offline, I was able to meetup with Hawaii’s top bloggers, access this post directly (if you’re seeing this in a feedreader) to watch video. Whenever I travel to a new city for business, I try to meet the local bloggers at a community dinner, I’ve now friends all over the world, and we connect on twitter, blogs, and social networks to keep track of each other. Ryan Ozawa (who has the only Hawaii licence plate “Blog”, see pic below), the community leader and early technology adopter helped organize this dinner of Oahu’s top bloggers. About 15 of us assembled at a local joint (I was the only tourist) and we had authentic food –minus the luau, dancing, or fire spinning. Believe me, this was a real treat for me. I’m not even going to link to the restaurant website as I don’t want to spoil it for the locals, but if you’re a smart web hunter, you’ll figure it out. I spent some time with Welton, who lives in Waikiki, he took me to some local bars after dinner, (Ryan’s) and gave me the low down of life in Honolulu from a local’s perspective. Some of the guys were live streaming the dinner from their phone, a bit grainy, but you can follow in from this player. Check out the coverage from Ryan Ozawa. Truly one of the most friendliest groups I have ever met, the Aloha spirit was really there, including receiving a gorgeous flower lei from Xapa. Heading back to Barcelona, Blogger Dinner? From Nov 14-17th I’ll be in Barcelona speaking at Forrester’s Consumer Forum event being held at Hotel Rey Juan Carlos. I’ll be presenting on Social Media Strategies, and I’ll be discussing how integration is key (a theme you hear from me frequently) to Europe’s top marketing community. According to Google Analytics, Spain is the third most visited country to my blog, nearly 10,000 visitors in the last month. If someone knows of any existing tech events on Thur or Friday nights maybe we could schedule a meetup, or even a blogger lunch in Barcelona on Sat. I’d LOVE to meet you. If someone can suggest a venue that’s easily accessible, it would be great to meetup. I’ll drag along colleague Peter Kim for the festivities. I’ve had meetups in Boston, Singapore, Hong Kong, Seattle, Portland, and would be excited to have one in Europe. Last night was the much anticipated Web/Blogger/Social Media/Live Web community dinner, (see guest list of about 100 attendees) the energy was high. Len Devanna of EMC volunteered to be the sponsor and did a fantastic job of hosting and organizing the event. A company whose brand is built on information recognizes the importance of how this ‘unstructured web data’ impacts storage, networking, brands, management, and knowledge can change traditional information. I have a long history of watching EMC from the sidelines, it was great to meet folks face to face. The room was buzzing with bloggers, podcasters, videobloggers, marketers, inventors, entrepreneurs, students from MIT, and even internet uncle Doc Searls came forward to meet and greet. I had so many fantastic conversations, and finally met some of the EMC bloggers (or employees who work at EMC and happen to blog, as one business card states) and had a quick conversation with social media practitioner and thought leader Beth Kanter. My new friend, and future co-speaker Chris Brogan was present, he’s one of the kindest souls in the industry. Who came the farthest? Mark, also known as Storagezilla, flew in from Ireland for this event. What really helped Boston come alive? Local team Red Sox wins 7-1. I found a quiet corner and video interviewed at least half a dozen folks, you’ll see these appear over the coming weeks. Below you’ll get a sense for the event, see all photos tagged bloggerdinnerbostonoct07, feel free to tag the photos of people you know. 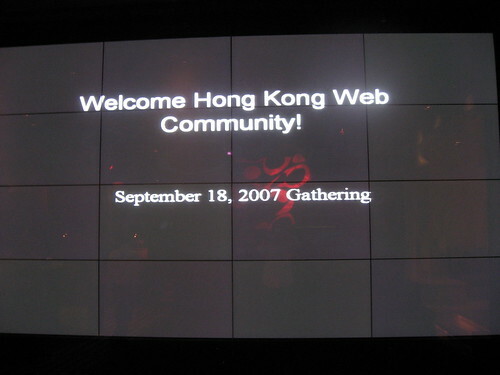 The Hong Kong web community came together in the central district (an area known for great bars and restaurants) at Prive’, on scenic Wyndham street. Of the 70 who showed up, there was a wide range of internet professionals. Outblaze, a white label communications company was the host, and we really appreciate them giving to the community, great job Ibrahim and Yusaf. See the full roster on the sign up page. I took the time to speak to as many people as I could, collecting business cards and asking them about what they did and how’s the HK’s web community. After talking to dozens, most would agree that the web community is still nasenct, only a few companies have emerged as HK’s largest focus is on Finance, Investment and Real Estate. The morning newspaper delivered to my door, as well as TV channels show an emphasis on Finance, and there’s not even a tech section in the newspaper. I believe that Singapore’s web community is just a little bit farther on. I encouraged everyone to try to continue to meet on a regular basis, and asked all the bloggers to raise their hands, look around at others and try to synch, same with Marketers (who I suggested should start a Social Media Club) and corporate folks (who should consider hosting a Lunch 2.0). These are ongoing community events that are designed to bolster the industry from networking, sharing, and collaboration. I did a handful of 2 minute video interviews, you’ll start to see a few of those published over the coming weeks, so I hope you subscribe. I met Victor Isaac Cheung of CNETS asia blog team. Warren Wong of Typhoon Games tells me that the largest area of the gaming industry is in Shanghai. JiJiJa provides network based recommendations, I’ve added them to my industry index. Rita at A8 offers a variety of internet marketing services. Vivien Chan of PCCW is pushing Video on Demand, they’ve a new feature called “Move”. Marcel of SynergySynq is a project management company for the web community. I met the founder of Recruit.net Asia’s version of SimplyHired. Napoleon is helping to organize a local BarCamp, and he’s the founder of Web Wednesday, a first-of-the-month get together. Kay Bayliss who is a digital marketing association Director. I saw my Singaporean friend Melvin Yuan, he just happened to be in town, how very serendipitous. Craig Jackson of the Priory is a wonderful host, he gave me directions to the right place, thanks. In HK, instead of business card, they call it “name cards”. The tag for this event is HKBloggerSept07. (copy that Technorati code to you blog, and tag photos please. I take great joy in seeing the web industry grow outside of Silicon Valley, thank you HK for coming out! Think you’ve had spicy food? Guess again! After the event, a few of us went out to dinner to enjoy authentic Szechuan cuisine (learn more). Yes, that’s a bowl full of peppers, somewhere in there is some chicken bits. It was unlike any type of spice I’ve had before, it was aromatic and made my mouth feel numb, almost like an anesthetic. Normal beer tasted sweet like sugar after eating just one small piece of chicken. Rebbecca MacKinnon, a Professor at HK University, citizen journalist, former CNN reporter has spent much of ther time in China, and speaks fluently, she put me to shame as she gulped down the spicy peppers and food. I could barely handle it, it was tough, thankfully, I’m not paying for it the next day, what an experience! Oh, and if you’re on business in China, here’s a cultural tip I learned on previous times here in HK, if you want to pay for the dinner, then you have to be sneaky, and slip out to the bathroom and pay when no one is looking. Chinese culture mandates a fight (can get violent) for hosts to pay for dinner, I’ve been cornered by one team while trying to wrestle the bill away from others, it’s a funny and entertaining experience in Chinese culture.